Before I get any further, I just had to post this. The Mom was in town this weekend. 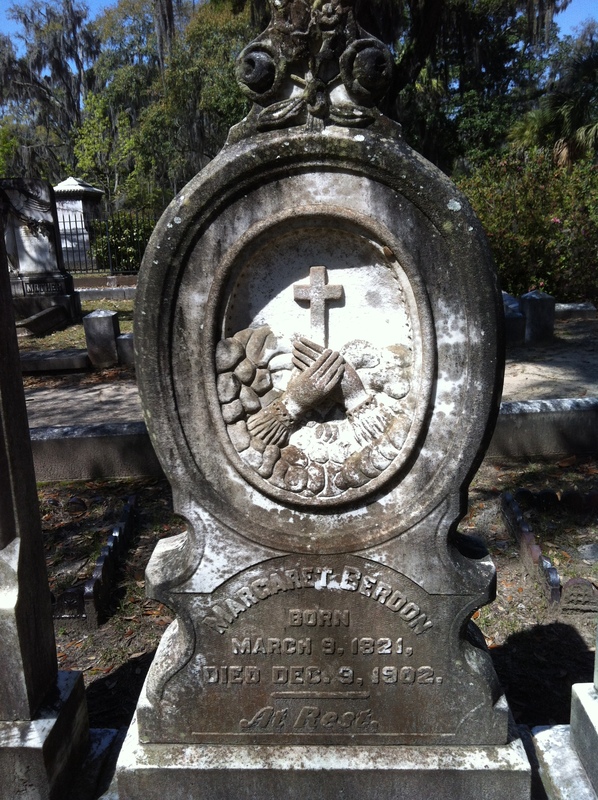 Being a typically beautiful April weekend here in Ol’ Savannah, we spent most of our time basking in the 75 degree weather, which ultimately took us to Bonaventure Cemetery. I got this shot of this incredible headstone while we were there. And even though Margaret Berdon passed away over 100 years ago, I’d like to think she’d appreciate the shout out. 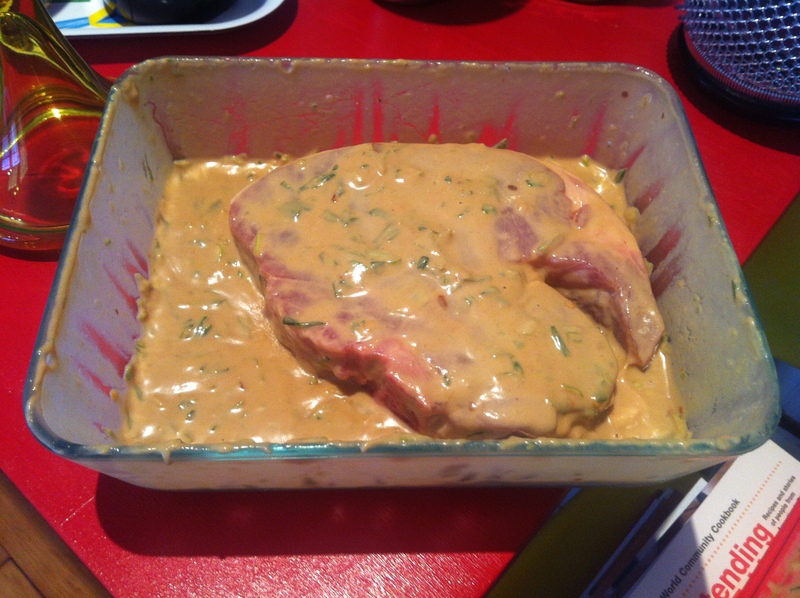 Anywho, changing subjects entirely…I’ve always kind of been obsessed with peanut sauce. I mean, what’s better?! As far as I can tell, not much. I haven’t quite seen this sauce all the way through, so I’ll have the full recipe tomorrow. Just know that tomorrow, you’ll be blessed with a delicious Peanut Sesame Scallion sauce that will probably make your head explode. I at least hope it’ll curl your hair a little. Currently, I’m marinading a pork chop in this delicious concoction. Just a little photo so you have something to look forward to. Until tomorrow!! Something a little different here today at the ol’ blog. I recently picked up some of this tasty stuff at my local market. To be honest, I only bought it because I was seduced by the packaging. I’m a slave to marketing, dammit!! I also like to try anything new that comes across my vision, but mostly, I’m a corporate puppet. ANYwho…luckily for me, the guy who works at the local market is quite friendly and quite knowledgable about all things beer. He gave me a little history lesson on this particular concoction, and after a little more research, I realized that I am currently in possession of a really cool piece of microbrewing history. The story goes like this. 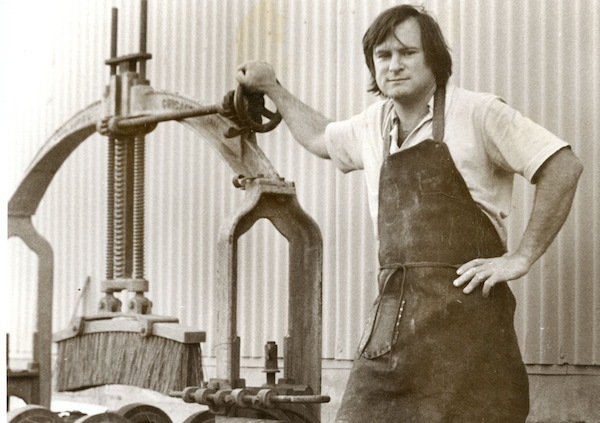 In 1976, in the beautiful hills of Sonoma, CA, Jack McAuliffe created what is widely considered to be the first modern microbrewery – New Albion Brewing Company. Here’s Jack, back in the day, in all his glory. Sadly, Jack was way ahead of his time, and the New Albion Brewing Company brewed it’s final batch of delicious ale in November of 1982, and subsequently folded…but not before Jack could inspire a whole host of beer enthusiasts who carried on his legacy and created the craft beer sensation that we are lucky enough to witness today. One of those enthusiasts was Jim Koch, founder of Samuel Adams, which I assume you’ve all heard of. 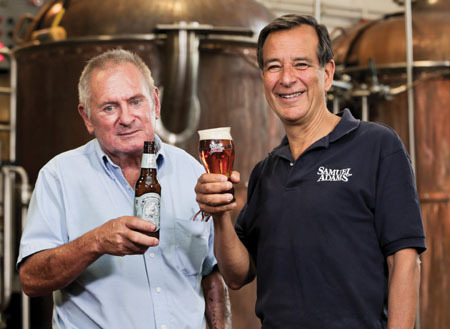 Luckily for us, Jim decided it was about damn time to honor Jack’s work properly, and has re-released the New Albion Ale with Jack’s blessing. It’s the first time this beer has seen the light of day in 30 years! And I gotta say, it’s absolutely worth the wait. It’s pretty light – lighter than the average ale, I’d say – but totally delicious and has a great hint of citrus on the back end. I really really like it. So kudos to Mr. Jack McAuliffe for his amazing vision and contribution to vastly improving our beer situation here in the US. And kudos as well to Mr. Jim Koch. I love that he still has such a passion for his craft after all these years. Here are these two awesome gents together! Granted, Jack looks a little ornery in this photo, but we’ll forgive him. 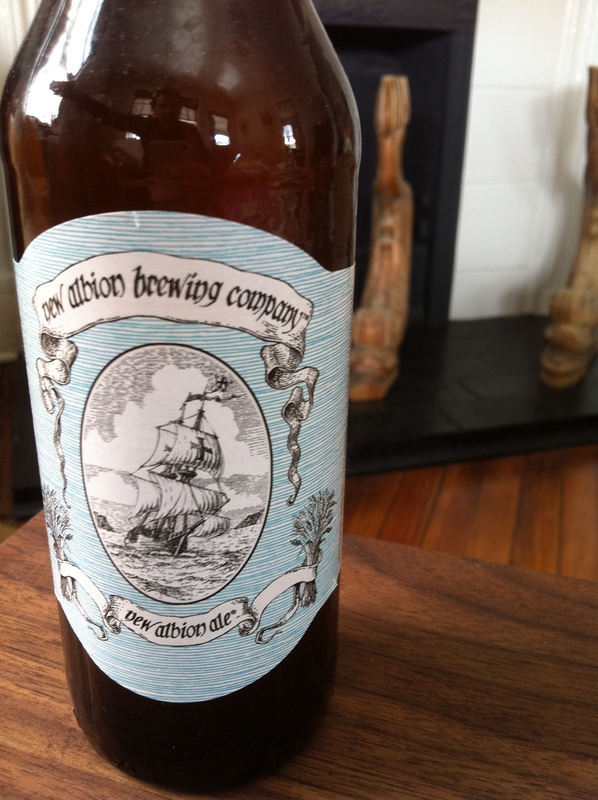 Go pick up some New Albion Ale today! Hello there, loyal readers. Apologies for being off the blog train for a few days. My travels to Atlanta have been a little busier than I expected, and involved helping a woman on the street who was having a seizure and making a fantastic sort-of-Ethiopian meal with some lovely friends. Who knew Atlanta was so full of adventure?! The biggest moment of my trip so far, however, was an absolute revelation called Your Dekalb Farmers Market. Holy crap, you guys. This place is HUGE. This photo doesn’t even begin to do it justice. It’s 140,000 freaking square feet!! 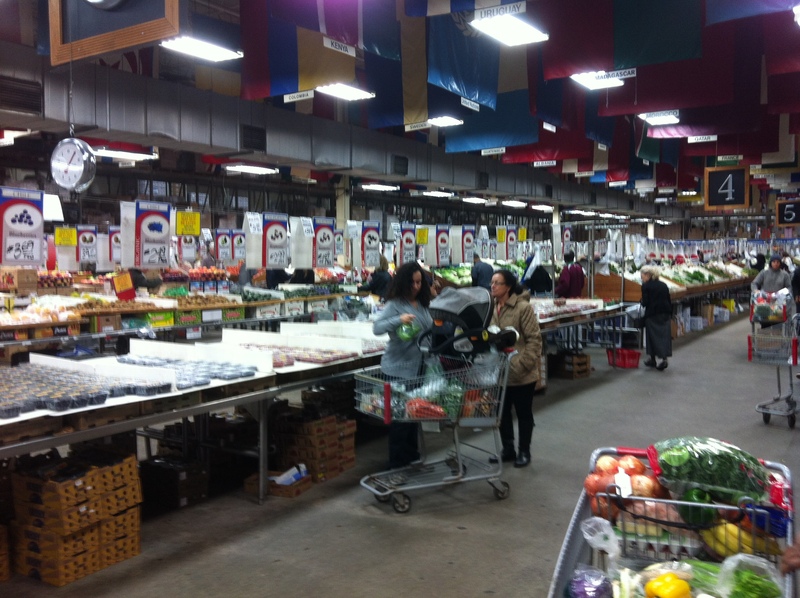 It has all the produce, spices, dry goods, coffee, cheese, and especially meat that you could ever want. I’ve legitimately never seen anything like it in my entire life. Check out these spices and grains I picked up! 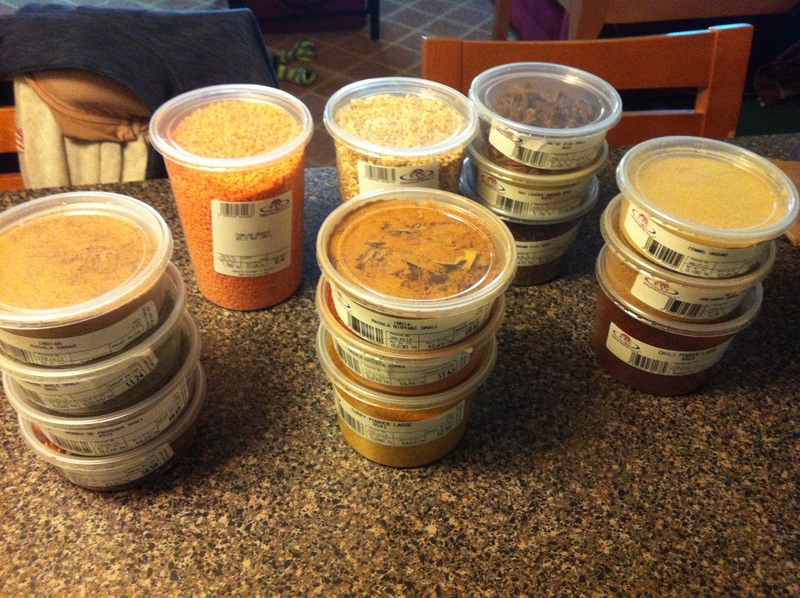 13 different spices, plus some lentils and some farro, all for a grand total of $21.39. Unbelievable. I mean, look at this. 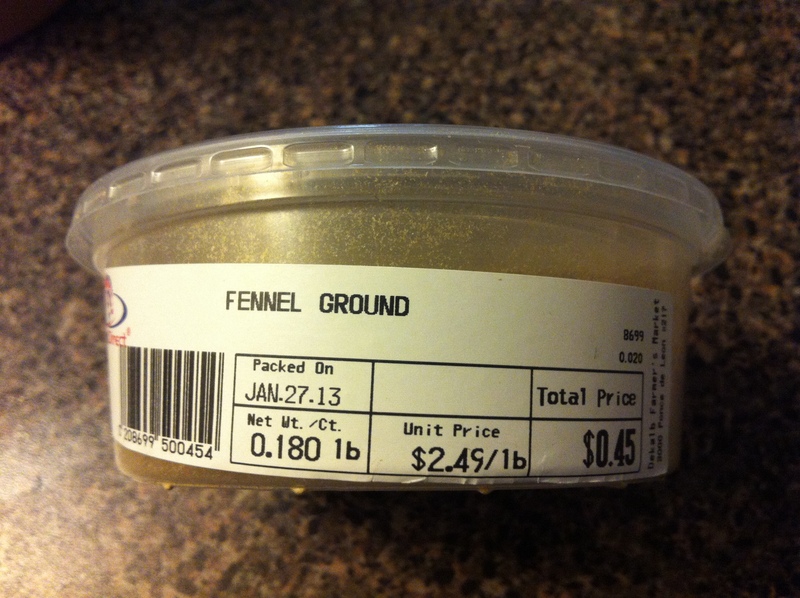 Ground fennel for 45 cents! I was so giddy and overwhelmed that I sort of just wandered around in the absolute grandeur for a while. I could probably spend 3 hours there. After grumbling about how we don’t have one of these in Savannah (hell, there closest thing in New York is Fairway, and it’s not even that close), my wonderful Atlanta friends and I went off to cook our Ethiopian meal. It ended up being fairly NOT Ethiopian, but it WAS totally delicious. Curried lamb. Roasted beets in beet glaze, lamb fat and onion reduction sauce. Fried and baked quail in pear and shallot sauce. Roasted yucca and purple sweet potatoes. Mmmmmmmmmmm. Cooking with friends is really one of the great pleasures in life. Anywho, I’m off to do some schmoozing, but I’ll be back tomorrow to finish off the week. 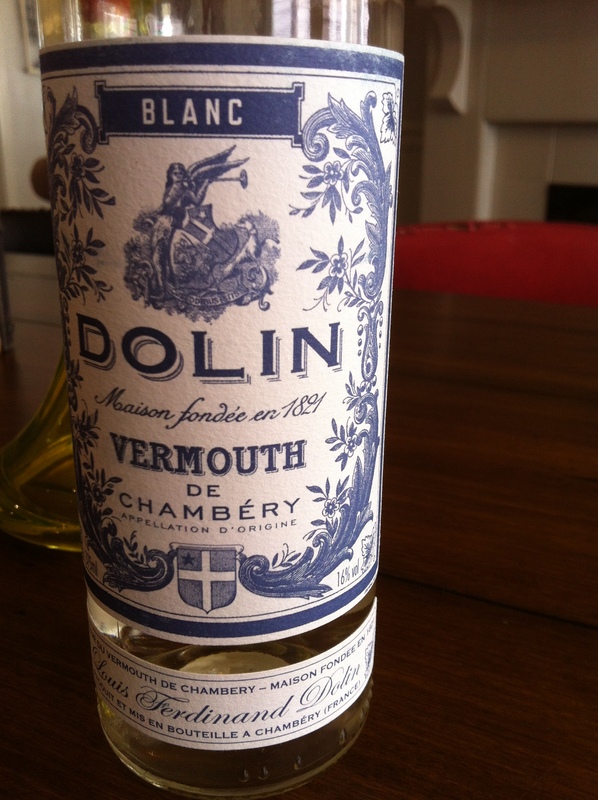 Fennel cocktails are definitely coming in the near future. Woo! Until next time. 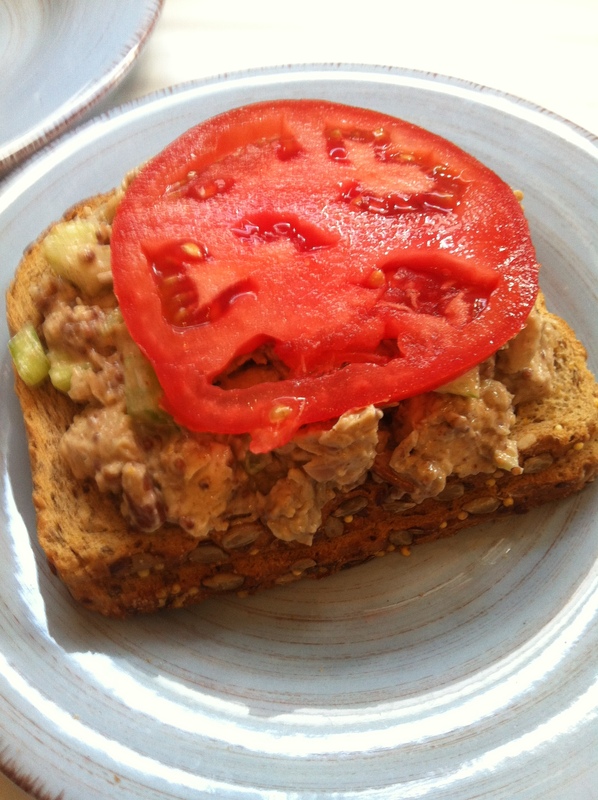 As promised yesterday, I’m back with a full-fledged and completely delectable chicken salad sandwich recipe. 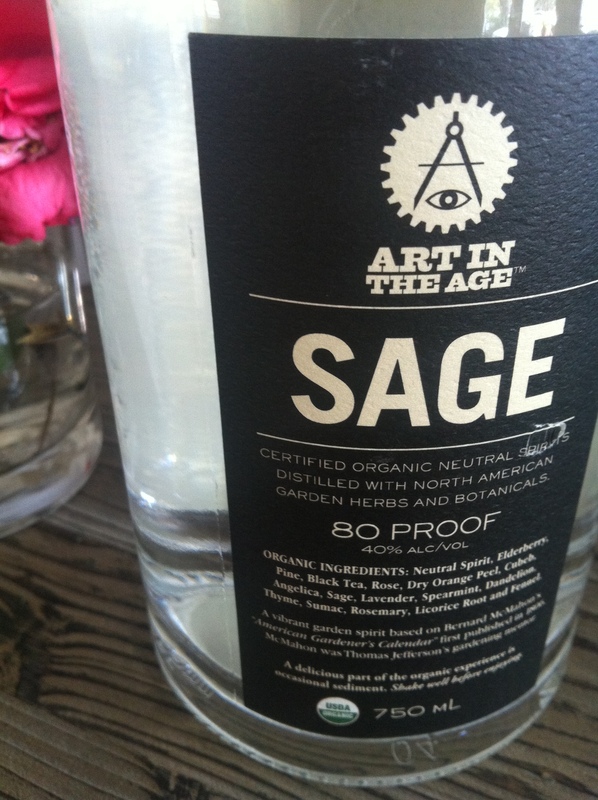 I have to say – it’s really really good! If I could send you all little care packages of it, I would, but alas, my resources are not unlimited, and I have a feeling it wouldn’t keep very well in the mail anyway. So, in lieu of a care package, I bring you the recipe. As most of my recipes go…this is a little open to interpretation. 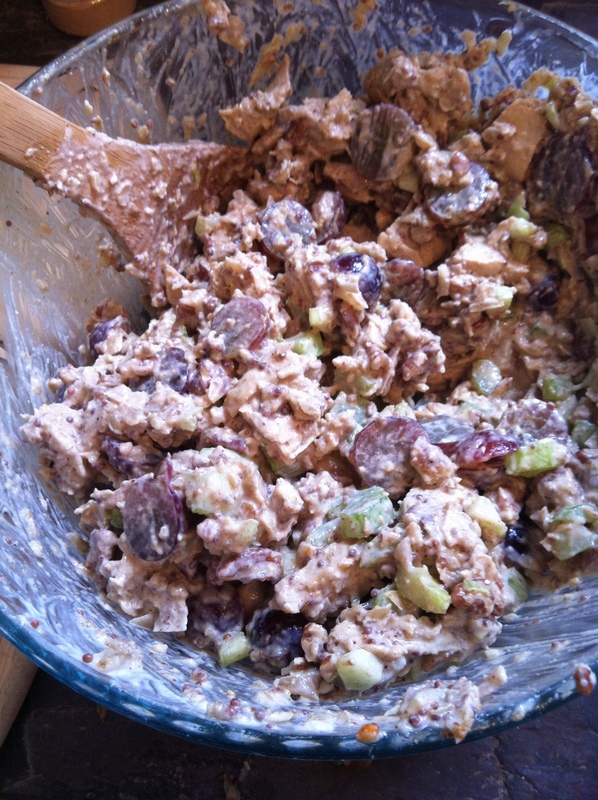 If you like a sweeter chicken salad, consider adding more grapes. Love mayo?! Add more. Hate mayo? Cut down on it. It’s yours to play with! 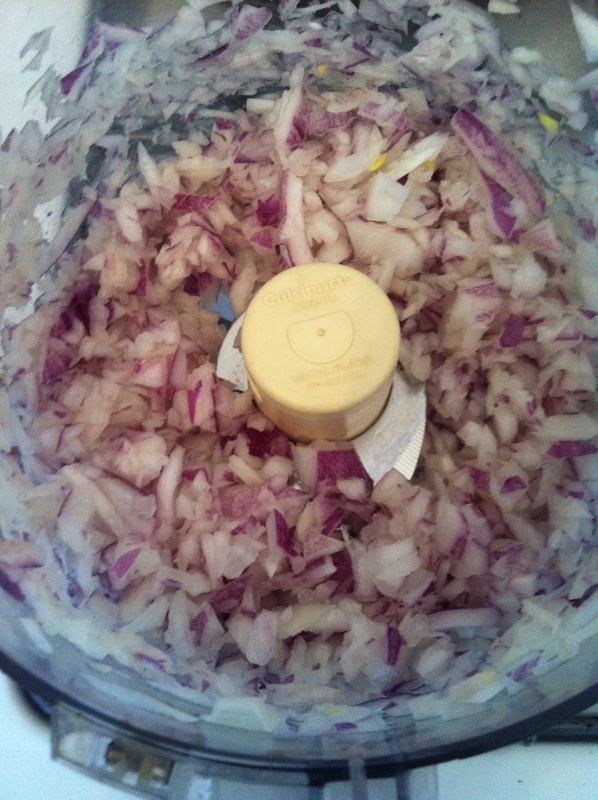 So first off, take your red onion and throw it in the food processor. 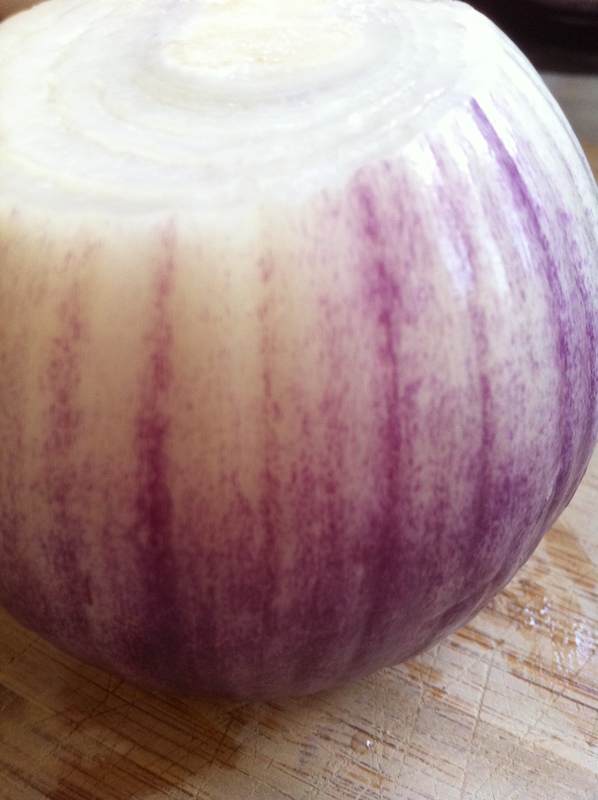 I just have to show you this gorgeous onion I got from the grocery store. Amazing colors, right?! It might sound totally cheesy, but I love when nature gives us colors like this. But I digress. Chop up some garlic fine, and then throw the onion and the garlic into a grill pan. You might want to spray a little cooking oil in the pan beforehand. And if you don’t have a grill pan, a regular pan should be fine. I just really loved the results I got from the grill pan. Just make sure to stir these once in a while. 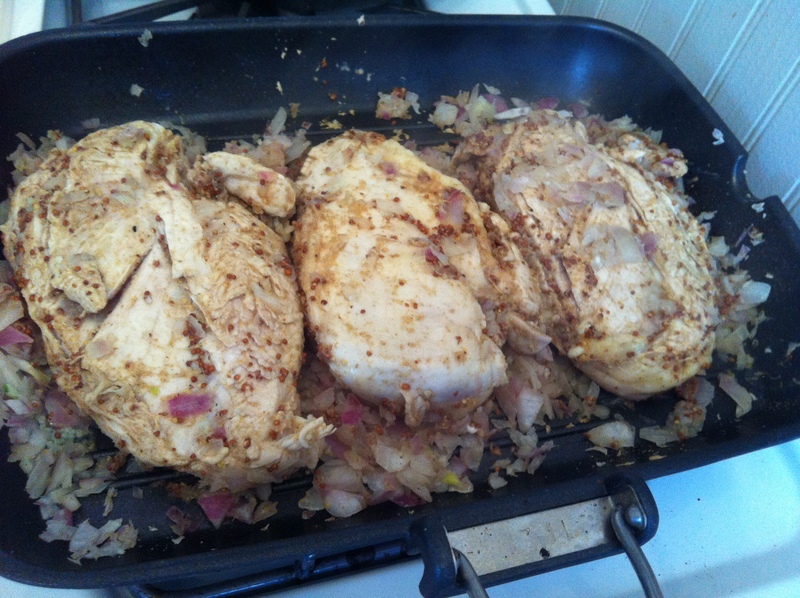 While the onions and garlic are cooking, you’re going to put the mustard rub on your chicken breasts. I used a roasting pan, but you can use any container where you have room to rub the chicken. 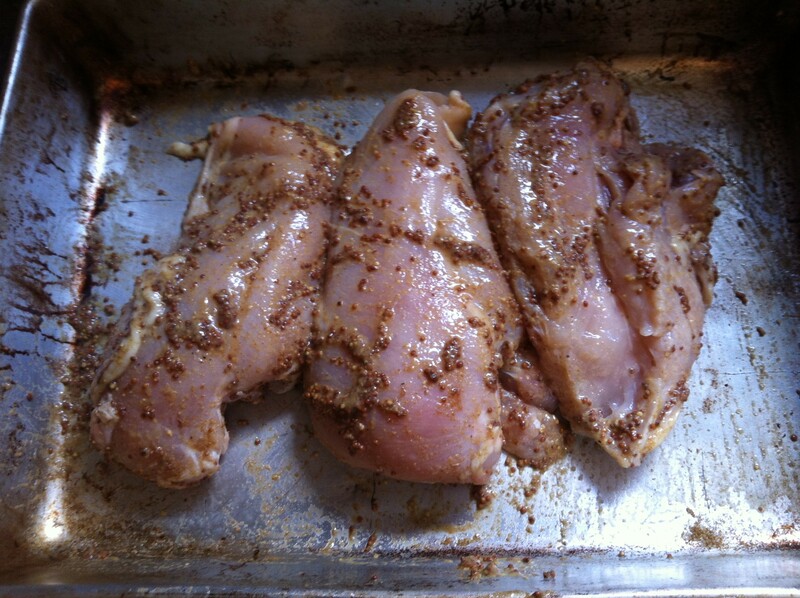 Rub it with the 4 tbsp of whole grain mustard and a liberal amount of garlic salt, cumin & jerk seasoning. Splash some lemon juice on there, and then toss it in the grill pan once the onions and garlic have been sufficiently sauteed. 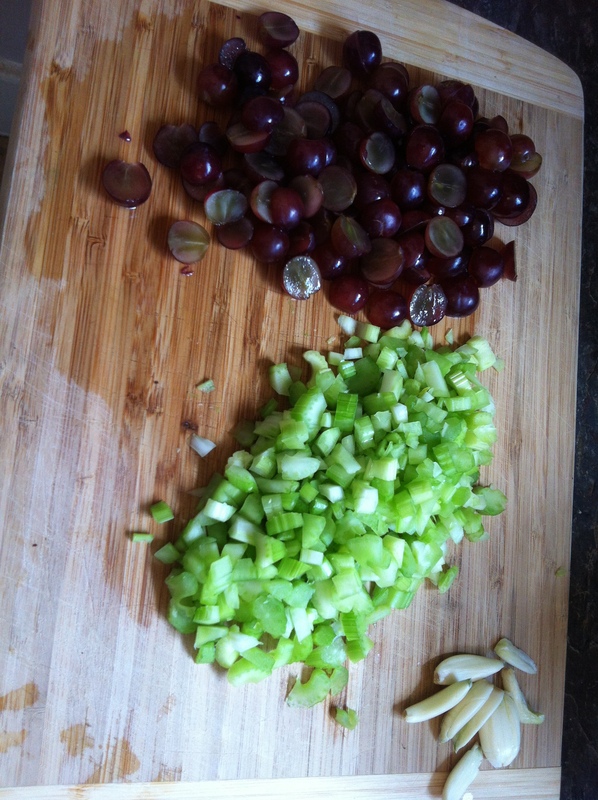 While your chicken is cooking, go ahead and dice the celery and halve the grapes. Once your chicken is done cooking, take the chicken off the grill pan and cut it up into small chunks. When your chicken has cooled a little, you’re ready to make your salad! 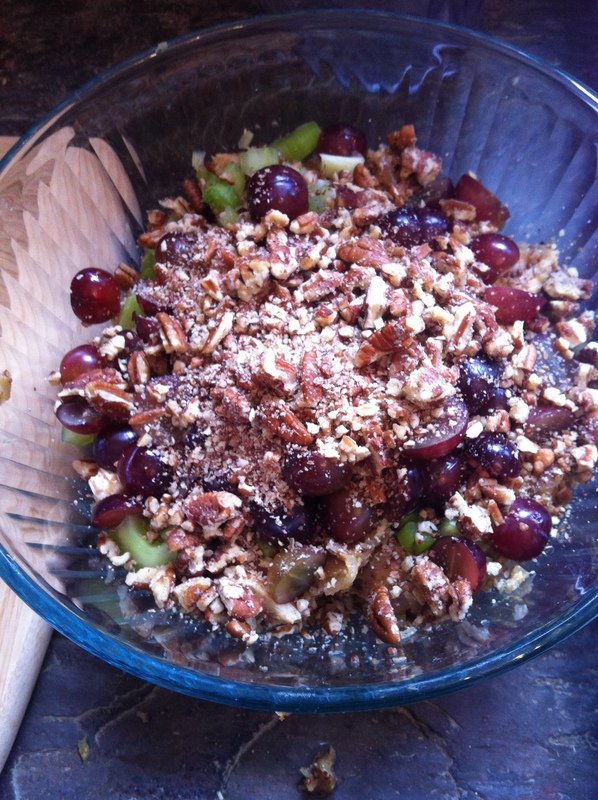 Take a large mixing bowl, and toss in the chicken, the onions and garlic from the pan, the grapes, the celery and the pecans. 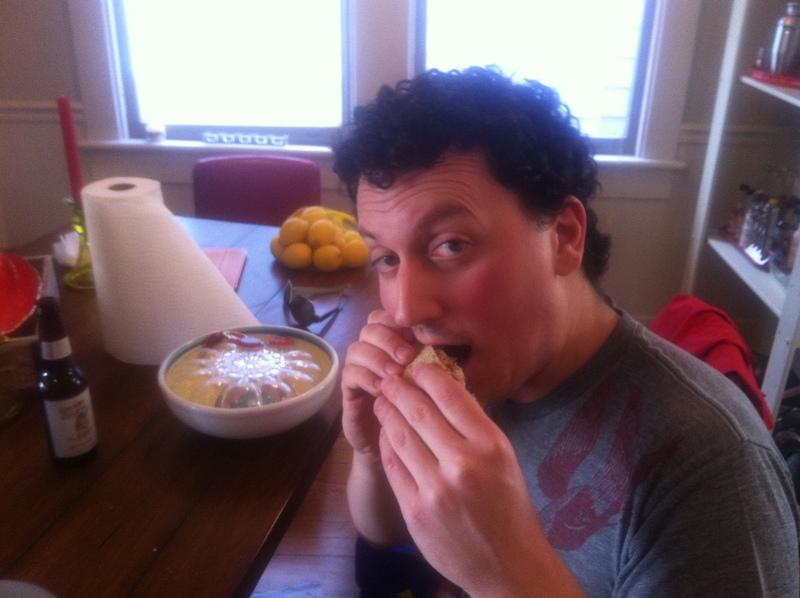 Then take the 7 tbsp of whole grain mustard and 10 tbsp of mayo and mix those in. Finally, throw in a liberal amount of garlic salt and jerk seasoning, and a little bit of Sriracha – about 20 drops, depending on how spicy you want it to be. And you’re done! 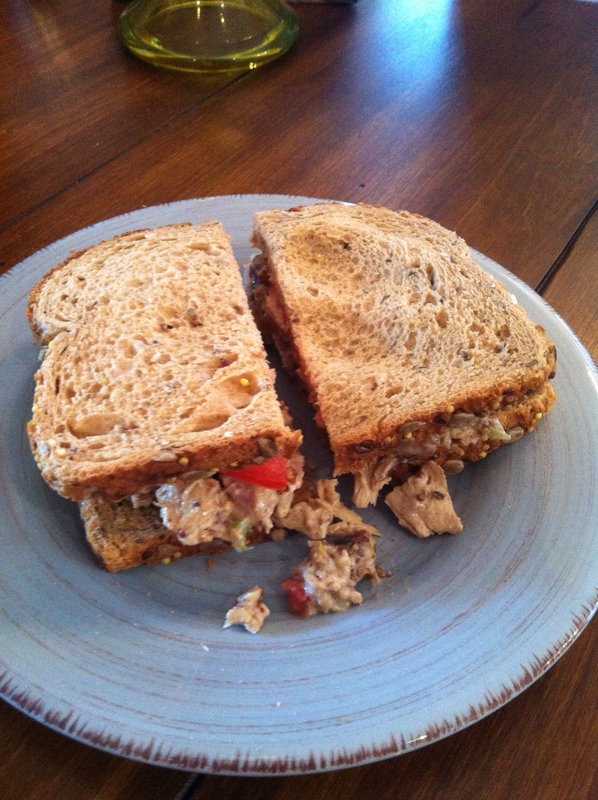 Now, this chicken salad is completely awesome on it’s own, but I think it’s even better in sandwich form. I used some toasted 9-grain bread and threw on a slice of tomato to complete the task. The result was pretty fantastic. So there you have it – what at least one person called the “best chicken salad ever.” Try it out! You won’t regret it. I’m actually gonna go make myself up another sandwich right now. Here’s a ridiculous photo of me enjoying it. More tomorrow! I’ve been pretty busy the last few days, so I don’t have time to get into the full recipe today, but I had to let you know that I just made some damn fine chicken salad, and I’ll be sharing the recipe tomorrow. Here it is in sandwich form. It’s the first time I’ve ever actually attempted to make chicken salad and I gotta say…I totally nailed it. My good friend Summer said it might just be the best chicken salad she’s ever had. So stay tuned for the recipe – it’ll make you do a little dance, I promise. It remains to be seen how true to my word I’ll be, but in my newly acquired bout of self-motivation, I’m committing myself to posting a blog entry here every single weekday. So look out! I’ve got exciting stuff coming up here at The Amateur Cocktailer. And it’s not just cocktails! Home brewing! Beer bread recipes! Silician rice balls! And then…some other things that I’ll think of to write about! Yeah! Anyway, I’m excited, and you should be too. It’s bound to be delicious. But first! Another delightful cocktail brought to you by the lovely city of Savannah. If you’re going to use the Sriracha, tread VERY lightly. I’d say 4-5 drops at most. This cocktail is a decidedly lighter version of the traditional Manhattan. It’s refreshing and bright and altogether pretty lovely, I think. So! More tomorrow. Yay for motivation! And for deliciousness. Something a little bit different today that my average cocktail fair. Honestly, it’s a little difficult to really voice this recipe, because most of the time when I’m cooking, I improvise and just do things with my favorite spices and ingredients until it tastes great. But I’ll try my best! The real secret is roasted garlic. If you’ve never roasted garlic before, it really couldn’t be easier. You literally take the garlic you want to roast up, wrap it in some foil, and stick it in the oven at 375 for about 20-25 minutes. You can roast it even longer, but I found that for this particular recipe, that amount of time at 375 roasts the garlic perfectly without making it completely into liquid – just makes it easier to deal with. So! Without further ado, here we go. Blend it all together for a few minutes in either a blender or food processor, and you’re set! With the spices, I really just played around until it got really delicious – so have fun with it. So if you have a food processor or blender, this is a super easy thing to make, and it’s actually a lot of fun. And you can make a TON of it. I used 3 cans of chickpeas (my food processor can’t handle any more than that) and I have enough hummus to last for quite a while. And it’s cheap! Anywho, I’ve said my peace for today. Another cocktail coming soon! Hey all you happy-it’s-Friday people out there. I’m shockingly busy these days, despite not having a paying job, so I’m gonna make this one quick, but I wanted to give you all a delicious cocktail to finish out the week with. I guess I’m on an Amaro kick lately. It’s so herbally delicious, even though herbally isn’t actually a word that exists in nature. But it sounds good, so I’m just running with it. 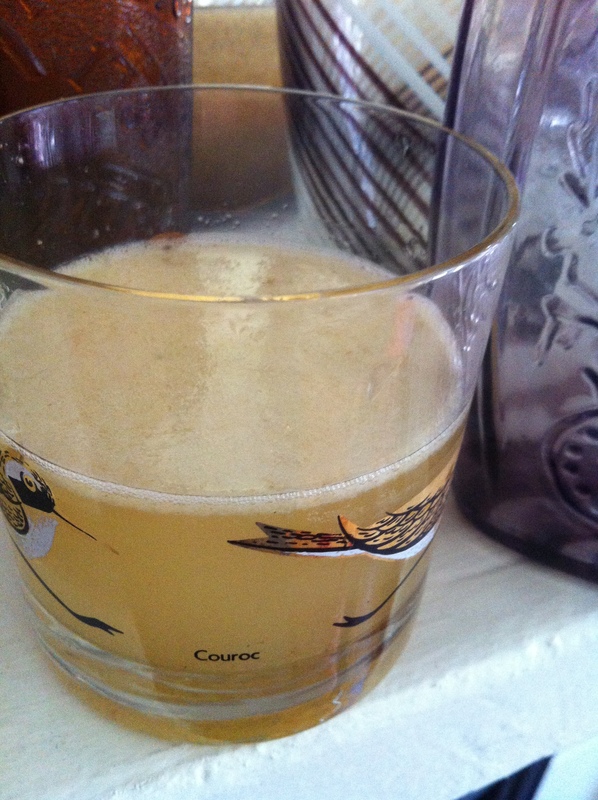 So, without much further ado, here’s my latest concoction made with that delightful, Italian liqueur. Without even trying, I’ve managed to celebrate two countries with red, white and green flags with this here cocktail. Tequila and Amaro, magically paired for your enjoyment. Anywho, here it is. Mix it all together, except the soda of course, and shake it like you mean it. Pour in your glass of choice, top off with a little soda, and your Friday just got a little better! 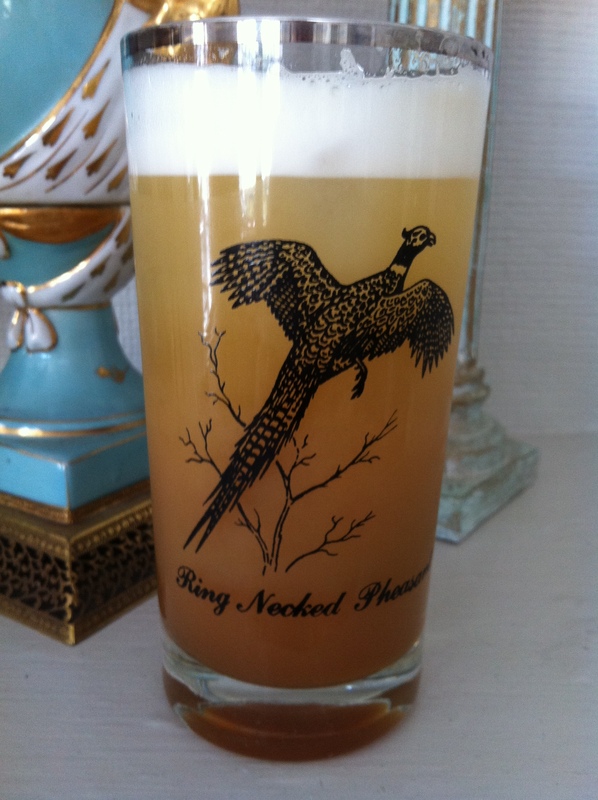 For those of you who haven’t spent much time in New York, you may not be aware of the strange phenomenon that is the beverage known as an egg cream. 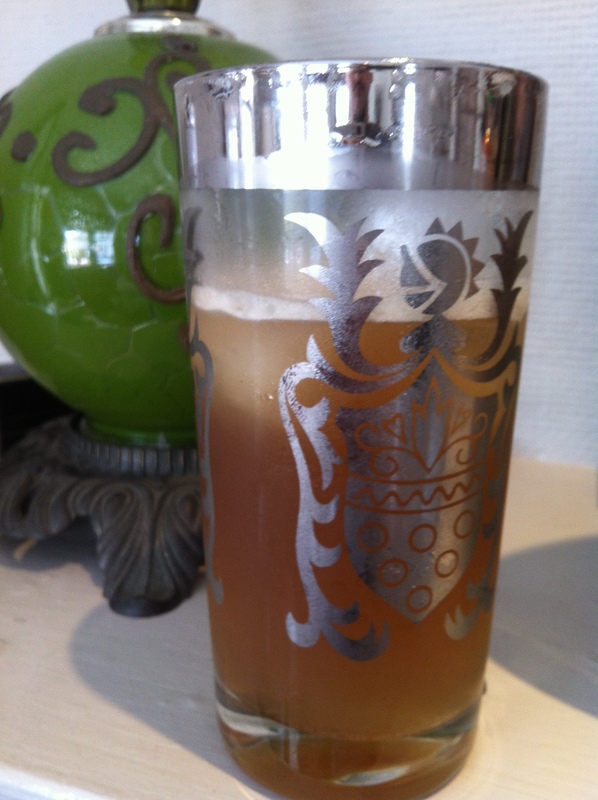 Despite what you may think, egg creams contain neither cream nor eggs. Discuss. Depending on where you were, the drink consisted of either vanilla syrup (New York) or chocolate syrup (Brooklyn), combined with milk and soda water. You got me. There are various theories on how the name came about, but I never really cared that much for this particular beverage in the first place, so let’s leave that aside for the egg cream historians to quibble over. In the meantime, I’ve created my own, pretty fantastic, completely different version of an egg cream, and lo and behold, it actually has egg in it! Plus, it’s got booze! So really, how can you complain? Okay, so there’s nothing particularly Georgian about this drink, but I created it in Georgia, so just go with me here. Anyway, put all this good stuff together in a cocktail shaker and go to town. Shaking vigorously will give you that nice foam on the top that you see in the photo to your right. This is an absolutely perfect after-dinner cocktail. I plan on making my new friends here in Savannah like me even more by having them over for a dinner party and then wowing them with this drink. Really, all kidding aside, I’m totally happy with this one, and I promise it’ll impress your guests. More soon! I’ve been busy working on a project out on Tybee Island, so my cocktail making adventures have taken a bit of a backseat, but I’m trying hard to get back on the blog train. So hopefully you few but loyal readers will have another post sooner rather than later. I’ll at least do a few more before the Mayans come down from space and wipe us all out.